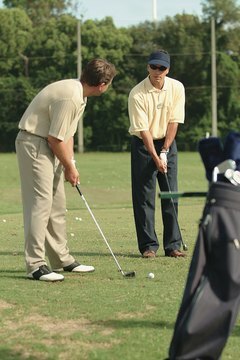 Take a lesson to improving your golf game. A golfer typically goes through several levels as he makes progress in the game over the years. A beginner may struggle to understand what it takes before making rapid progress and then hitting a plateau. The same holds for golfers at all levels, with periods of rapid progress followed by plateaus. Those times can be quite frustrating, but there are steps that a golfer can take to improve his game. Concentrate on one area of the game more than the others. You want to improve your driving, your fairway play, your short game and your putting, but don't try to accomplish it all at once. The next time you go out, concentrate on your driving and make that the priority for your game. You will certainly prepare for your other shots, but the bulk of your mental concentration should be on your work with the driver. Understand that accuracy and not distance is the key to improving your score and your overall game. Go to the driving range and pick out a target and try to hit 10 balls in that area. Then find another target and hit 10 more balls. Don't just go and try to bash the balls. Have specific targets and keep track of how many you can hit. Go to the practice putting green with five balls and work your way around to the different holes. Try to put the same stroke on the ball every time you putt. Consistency in your putting approach will be the key to your improvement. No, they all won't go in the hole, but the more consistent your swing the better chance you have of getting better. Take a lesson from a PGA or LPGA professional. Not only do you want the critique of your swing, but you want to understand what it takes to play consistently. You need your own philosophy when you play but it's great to hear the thoughts of others, especially golfers who have been successful. Take the pressure off of yourself. Remember the reason you took up golf in the first place. You are playing because you enjoy it. Appreciate the scenery and the beautiful day. Don't go to the first tee and say you have to break 90 or whatever number you have in mind. Keep your mind on your business but don't over dramatize your round of golf.